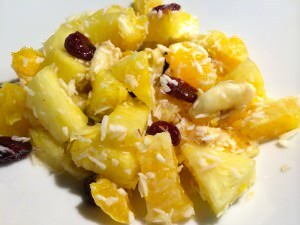 Mix together the oranges, pineapple, coconut and cranberries in a medium bowl. In a separate bowl mix all the liquid - the orange juice, water and almond extract then pour it over the fruit. Toss until evenly distributed. Serve or store covered in a container in the fridge for up to two days. © 2016 Caroline's Plant Based Diet. All rights reserved.